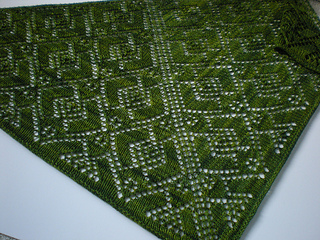 The stunning leaf and diamond geometry of the stitch pattern used in this top-down shawl reminded me of an intricate garden hedge maze, such as the one described in Kate Morton’s engrossing novel, The Forgotten Garden. Three sizes are given; the size can also be adjusted by changing yarn weight and needle size (adjust yardage accordingly) or by changing the number of half-repeats worked. Skill level: Intermediate to Advanced. 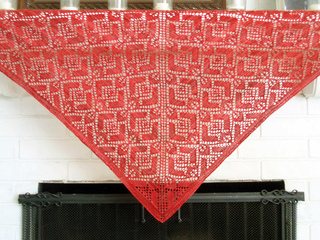 Due to the length of the stitch pattern repeat, only charted instructions are provided. 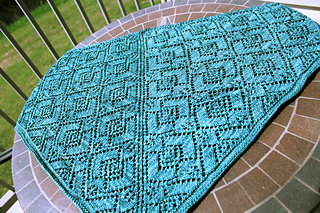 The lace stitches are worked only on right side rows; they are not technically difficult but do require concentration. Red large sample used Biscotte & Cie La Douce, color: Cherry Baby, 2 skeins. Small brown sample used Madelinetosh pashmina, color: Violin, 1 skein (note almost the entire skein was used, with little to spare).